Professor Stephen Hawking will see one of his biggest dreams become reality as he’s set to venture into outer space soon. Stephen Hawking gave an interview to Piers Morgan on “Good Morning Britain”, where he confirmed that he’ll be going to space on Richard Branson’s Virgin Galactic spaceship. Branson actually offered him the trip in 2015 for free, and Hawking says “since that day, I have never changed my mind.” When the flight will be we don’t yet know. Virgin Galactic’s SpaceShipTwo was previously slated to launch at the end of 2017, but no hard date has been announced yet. Hawking’s spaceflight will be an amazing feat for the 75-year-old scientist, known for his work in physics and cosmology, adding another chapter to an already remarkable life. When he was only 21, he was diagnosed with amyotrophic lateral sclerosis (ALS) also known as Lou Gehrig’s disease. This rare neurogenerative disease is deadly and Hawking was told he had 2 years to live. 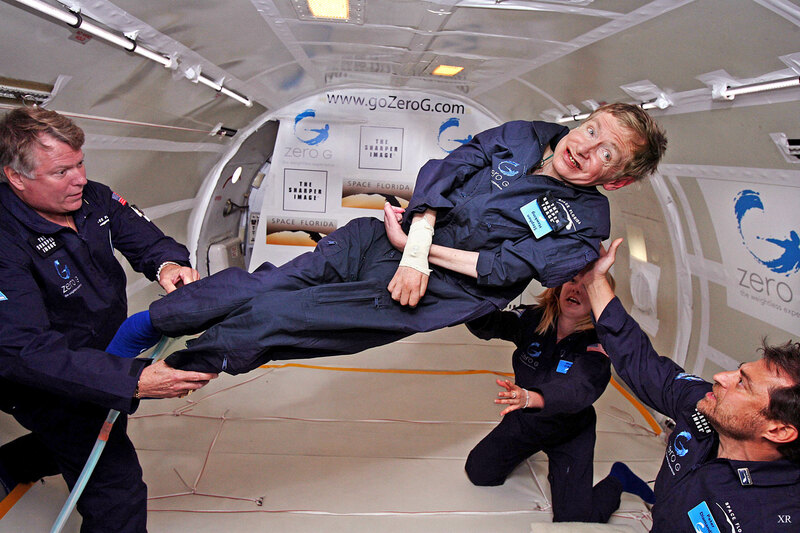 50+ years later, Hawking is still going strong (and going to space). Paralyzed and confined to a wheelchair, speaking through a specially-designed computer system since 1985, the scientist has achieved more than most do in a lifetime, not letting the debilitating disease slow him down. Hawking has done groundbreaking work on black holes, discovering (along with James Bardeen and Brandon Carter) four laws of black holes mechanics. His 1974 “Hawking radiation” theory that black holes are slowly evaporating due to particles robbing them of energy can still land him a Nobel Prize as recent research appears to prove it. He has also done outstanding work on gravitational singularities, one-dimensional points that have infinite mass in infinitely tiny spaces. Cooperating with mathematician Roger Penrose, Hawking proved the existence of singularities and proposed key theorems on their origins. His other scientific achievements include pioneering work on cosmic inflation and the early state of the universe (which Hawking proposed had no time or beginning). Hawking is also famous for being one of the world’s most popular science educators, writing numerous books like the bestseller “A Brief History of Time,” which sold more than 10 million copies. How did Hawking, who also has been a professor of mathematics at University of Cambridge for the 30 years, thrive despite the illness? In an interview with Scientific American, ALS expert and professor of neurology Leo McCluskey, called Hawking “an outlier”. His case is exceptional and probably represents just a few percent of ALS patients. If Hawking developed the disease while still a teenager, it could be a “juvenile-onset” variant that progresses very slowly. He has also had great care.